Contact/Applicant: For further information please contact Andrew Tipple of Bedford Borough Council's Engineering Services, Tel: 01234 276802. Reason: To facilitate drainage work. 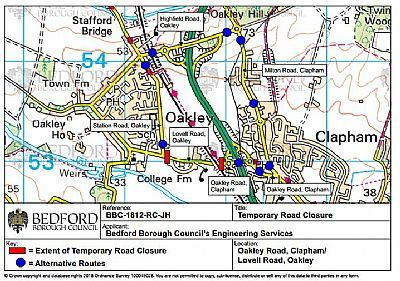 Dates: This temporary road closure is anticipated to be in operation between 9:00am and 3:30pm on 5 weekdays from Thursday 22nd March 2018 to Wednesday 28th March 2018 inclusive - Specific dates will be advertised locally closer to the time - Where possible access will be maintained to property and premises but may be restricted from time to time according to local signage. Signed Alternative Routes: Proceed in an easterly direction along Oakley Road, Clapham, across the A6 to the roundabout at the other side. Take the 2nd exit and continue along Oakley Road to Milton Road, Clapham. Turn left and continue to the roundabout adjoining Highfield Road, Oakley. Take the 1st exit and continue to Station Road, Oakley. Turn left and continue to site, and vice versa.